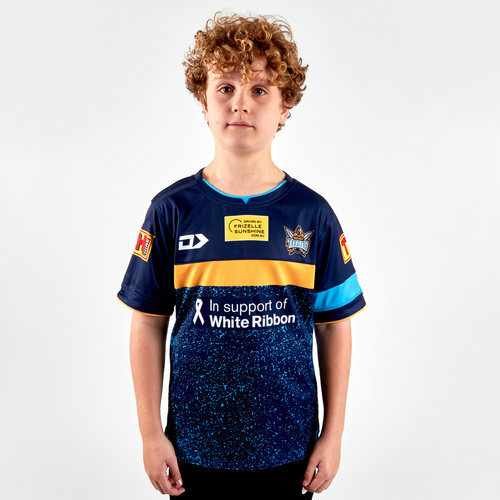 Cheer on the Titans when you're at the Cbus Super Stadium or when you're making the most of your training in this Gold Coast Titans 2019 NRL Kids Rugby Training T-Shirt from Dynasty Sport. The Gold Coast Titans play their rugby in Austalia's premier rugby league competition, the National Rugby League NRL. It is the youngest of the sixteen clubs in the league, having commenced its inaugural season on 18 March 2007. Before the 2018 NRL season began most experts predicted Gold Coast to be contending for the wooden spoon come seasons end but the club shocked many critics after winning 3 of their first 5 matches. Gold Coast then went on an inconsistent run of form and ended finishing 14th on the table at the end of the regular season. Hoping to put 2018 behind them and compete in a successful 2019 season the club has a kit collaboration with Dynasty Sport but for these supporters shorts the clothing manufacturer ISC has been used. Furthermore, the club's consortium aligned themselves with Gold Coast Radio Station 90.9 Sea FM, and set up a competition in which listeners could submit possible names for the new team. This was shortlisted into ten names, which through online voting was shortened to three which was then shortened to the remaining name, Titans. After the team name was chosen, fans were given six jerseys to vote for on the club's website, with option 6 ultimately being successful. The fans chose the club colours to be white, sky blue, navy and gold. Sticking to what is a relatively new tradition this shirt is predominantly navy with sky blue, white and gold detailing. The Mens Training Tee is developed using cutting-edge fabric technology, coupled with Dynasty Sport's premium training fabric. The top features natural wicking and breathable properties ensuring your comfort for your most gruelling training sessions.